The scene: America’s own 34-yr old heavyweight champion (of the world) versus Japan’s reining heavyweight wrestling champ at the Budokan Arena in Tokyo. 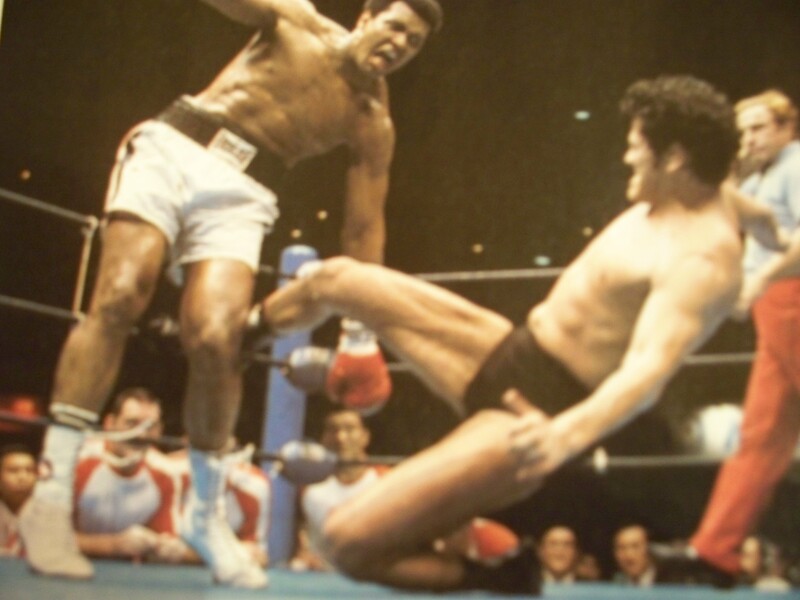 In a 15-round snooooze… The Greatest throws just 2 punches as Inoki spends most of the bout on his back, playing footsy with Ali. The fight is ruled a draw. Ali later swears off gimmick fights, but changes his mind 3 years later and whips NFL defensive lineman Lyle Alzado in 8 rounds. Inoki went on to win a seat in Japan’s parliament – representing the Sports and Peace party. The Ali fight was shown live on the Big Screen at Shea Stadium in Queens, New York. BEFORE the Ali-Inoki fight, there was an equally strange live face-off in Flushing. Andre The Giant – the famous 7’5”, 430 lb pro wrestler – took on ranked heavy weight fighter Chuck Wepner. The Giant (Rest in Peace) whipped Wepner around, then picked him up over his head, and tossed him completely out of the ring. This scene was later identically re-enacted in Rocky III when Rocky fights Hulk Hogan.